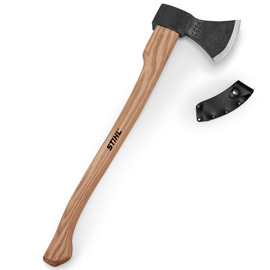 Forestry Axe made from high-quality materials in an exclusive design. This special edition features a "1926" imprint signifying the year STIHL was founded. It embodies the tradition and staying power of the STIHL brand. The tool heads were forged by hand from a special kind of high-quality steel. The mountain ash wood handles are double waxed. Admirers of high-quality craftmanship will appreciate these exclusive tools, each of which comes with an embossed individual production number. Approx. 70cm, 1200g. Highly suitable for pruning, splitting and felling small trees with an axe. Appealing leather cutting edge protection.